Approximately six months following the death of his parents, at the age of 18, he attended church and heard this reading from the Holy Gospel: "If you would be perfect, go sell all you have, give to the poor, and come, follow me" (Matthew 19:21). Saint Anthony took this Gospel reading as a personal invitation addressed to him by God. St. Anthony's friend after a length of time returns to the tomb and finds St. Anthony unconscious, and carries him to the village church as he believes him to be dead. St. Anthony wakes in the middle of the night and insists on being taken back to the tomb where he challenges the demons attack. St. Anthony prays to God, "Where are you? Why did you not appear from the beginning to cease my pains?" St. Anthony heard this reply, "I was here Anthony, but I waited to see you struggle. Because you have remained firm and have not yielded, I will always be your helper, and I will make your name known everywhere." St. Anthony's path TOWARD TRUE RIGHTEOUSNESS was not only marked by his spiritual struggles but also by his long-suffering. This is a story from the "Sayings of the Fathers". "It happened that temptation fell upon a brother in the monastery of Abbot Elias, and they cast him out. He came to the mountain to Abbott Anthony. After he had been with him for some time, Abbott Anthony sent him back to the community from where he came. But when they saw him, they again drove him away, and again he made his way to Abbott Anthony, saying, "They would not receive me, Father." "A ship was wrecked at sea, and lost all the cargo that it carried, and with hard toil was the empty ship brought at last to land. Is it your wish to sink on land a ship that has come safe from sea?" They recognized that it was Abbott Anthony who had sent him back and immediately took him in. "The saintly Athanasius, bishop of Alexandria, had summoned the blessed Anthony to that city to refute the heretics there. Didymus, a man of great learning who had lost his eyes, came to visit St. Anthony and the conversation turned to the Holy Scriptures. 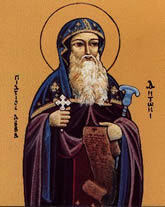 St. Anthony could not help admiring his ability and his insight into the scriptures. At last, he said, "You do not regret, do you, the loss of your eyes?" At first Didymus was ashamed to answer, but when he was asked a second and a third time, he frankly confessed that his blindness was a great grief to him. To this St. Anthony replied, "I am surprised that a wise man should grieve at the loss of a faculty which he shares with ants and flies and gnats and not rejoice rather in having one of which only saints and apostles have been thought worthy." Many great and noted philosophers sought out St. Anthony's wisdom. A philosopher once asked St. Anthony, "Father, how do you hold up deprived as you are of the solace of books?" He replied, "My book, philosopher, is nature and thus, I can read God's language at will." Philippians 3:12 states, "Not that I have already attained, or am already perfected but I press on, that I may lay hold of that for which Christ Jesus has also laid hold of me." Here St. Paul is telling us to enter into the struggle of faith, confident that the Lord Jesus Christ has made us His own, but knowing that we are not yet perfected. The goal is to zealously move toward TRUE RIGHTEOUSNESS--- toward the completion of our salvation---the resurrection toward eternal life. St. Anthony was a saint whose example followed this exhortation. In II Corinthians 12:9 we read of St. Paul's weakness were being the means of the power of the Lord Jesus Christ remaining in him. The same can be true of St. Anthony found beaten in the tomb and upon returning hearing the Lord's voice. "And He said to me, "My grace is sufficient for you, for My strength is made perfect in weakness," Therefore most gladly I will rather boast in my infirmities, that the power of Christ may rest upon me." We also know that St. Anthony denied fear. He even denied having fear of God. St. Anthony often stated, "I do not now fear God, but I love Him, for love casts fear out of doors." This saying demonstrates the consuming and great love St. Anthony had for the Lord. I John 4: 18 tells us "There is no fear in love, but perfect love casts out fear, because fear involves torment. But he who fears has not been made perfect in love." We all need to abide in this love of God. St. Anthony was a just and upright man seeking righteousness. In Hebrews 12:23, St. Paul is telling the Hebrews of the Heavenly Jerusalem. St. Paul is imploring them to seek God's Kingdom first. It is a spiritual place, not a physical one. It is a place inhabited by God, the angels, and the SPIRITS OF JUST MEN MADE PERFECT. It is here the communion of saints is established. The verse reads, "to the general assembly and church of firstborn who are registered in Heaven, to God, the Judge of all, to the SPIRITS OF JUST MEN MADE PERFECT." Just men made perfect also parallels St. Anthony's life. This is simply addressing those men in unity with their bodies made perfect. These are the glorified men consumed with divine energy. They are without the human limitations we now experience. Finally, Psalm 138 was written concerning "The Lord's Goodness to the Faithful." I believe this Psalm of David to be also an anthem belonging to St. Anthony as St. Anthony brought praise to the Lord with his whole heart. Do not forsake the works of your hands." "Wherever you go, let God be before your eyes; Whatever you do, do it according to the testimony of the Holy Scriptures; And in whatever place you abide, do not easily leave it." "Be not confident of your own RIGHTEOUSNESS; do not worry about the past; and control your tongue and stomach." "I saw all the snares that the enemy spreads out over the world and I said groaning, "What can get us out from such snares?" Then I heard a voice saying to me, "Humility!"